I like to experiment with software to try to push the boundaries of what I can make within the limits of the tool. It’s good to work with systems outside of your normal toolbox. You will see how another profession thinks about presenting information. My husband and I recently took a bus tour to Northern Ireland (in a bright green bus with leprechauns on it!). I knew that I would be mapping the photos, just having turned on geolocation on my phone. Now all my photos are tagged to a lat/long coordinate. I’m experimenting with how I like this and what I can do with it. During the online course I took a few weeks ago, there was an exercise to map your photos. That’s when I discovered mine were not tagged. I do remember turning this off and other privacy features when I got the phone. Of course I took a ton of photos, but Story Maps can only handle 100 in one Story, which is plenty. As we traveled, I did think about how I could convey the trail. We stopped at cities, where I have a concentrated batch of images, and also at sites along the road that involved fewer images. I also wanted to convey the in-between bits when we were on the road, so my story would have less holes. I took long shots and close up shots to try to convey the character of the areas were were in. The opener screen is cluttered. How do I start? I wanted a particular type of story, somewhat linear, but the main aspect was to plot my journey over a large area. From the Gallery, I chose the “Map Tour” template. It’s pretty straight forward. Then I dumped in the photos. This took a few tries to understand the mapping. Again, I had to put the photos in Flickr, which I’m not really happy about. (I need to figure out how to make a csv file of my images, to avoid Flickr.) Story Maps prompts you to find and import your images as soon as you create a new story. It places nice little numbered flags for each image on a map. You can add photo names and descriptions right in Story Maps. And you can organize the order of your photos in the editor and move the flags around on the map. Your flags land where you took the photo, not where the thing is that you photographed. For instance, if you are shooting a castle in the distance, your flag will be where your tour bus stopped so you could take that photo. You might want to re-position the flag at the castle, instead of at the tour bus, which obviously, is no longer there. You have a few basemaps to work with in Story Maps, but as usual, I wanted to enhance mine. I dug around online and found some instructions on how to customize your basemap in ArcGIS. Great! 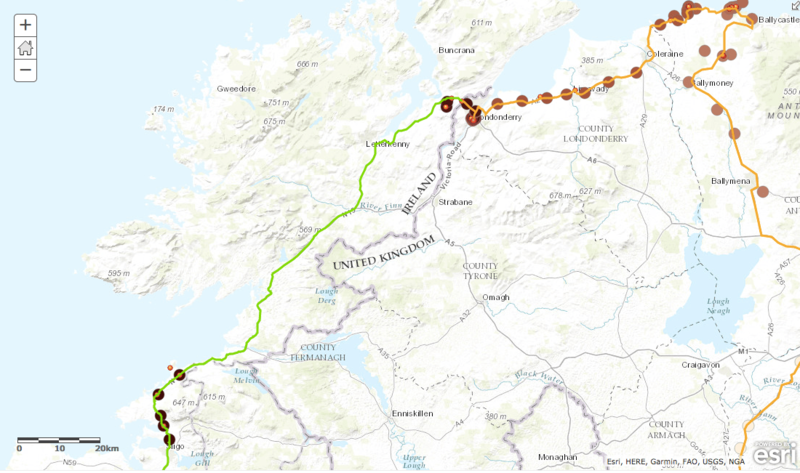 I drew the approximate route that the tour bus took, green in the Republic of Ireland and orange for Northern Ireland. Yes, this is cliche, but it provides important visual information. I saved that and brought it into Story Maps and a HORRIBLE thing happened – I lost all of the captions and titles I had just spent 40 minutes inputting! Luckily, I had only captioned about 20 photos. With help from my tech support/husband, we realized having ArcGIS and Story Maps open at the same time is a NO NO. 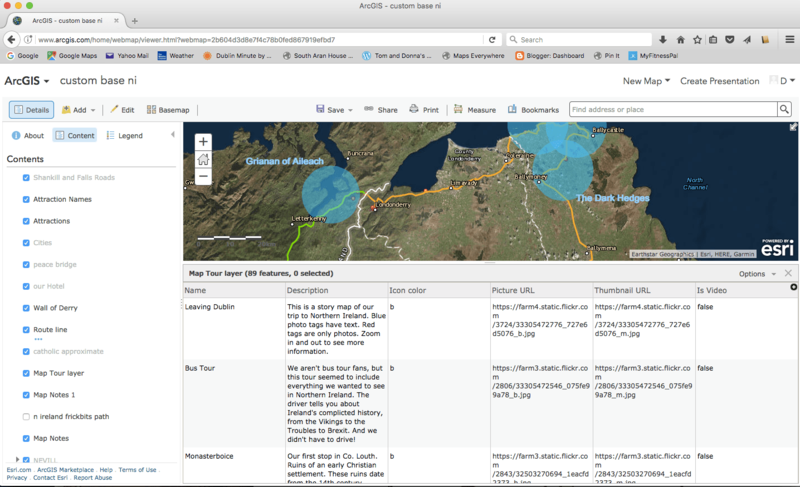 There is no warning that you are going to save over your Story Map when you are working in ArcGIS. So you can work back and forth, but not in “real time”. 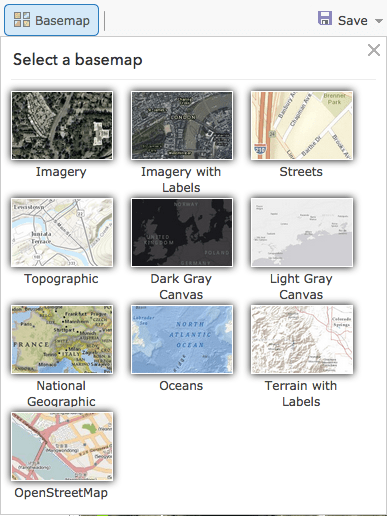 The ArcGIS map stores your Story Map photos, titles and captions in a layer with a spreadsheet. Since there doesn’t seem to be a way to copy and paste the spread sheet out of Story Maps, I saved that layer separately, just in case of another mishap. You cannot delete or re-position your photos in ArcGIS, but the locations do show up. Layers and image spreadsheet. You can edit your captions here, in ArcGIS. Back to the basemap. I experimented with Visibility. When you can see all of Ireland, I have large circles around the major cities we visited (see the featured image at the top of this page). When you zoom in, these go away. The bus route is visible at all levels. I added blue circles and text for “attractions”, which also disappear at a large scale. Londonderry/Derry has its old fortified wall still intact, so I dug around in ArcGIS and found that someone had rectified an old map of the walled city. I’m using that, but it is only visible at a large scale, otherwise it makes the map too cluttered. I also added green shapes to show an approximation of the major Catholic areas of the city. I’m working on a laptop, and the viewing area is very small. I’d like to see it on a full scale screen. 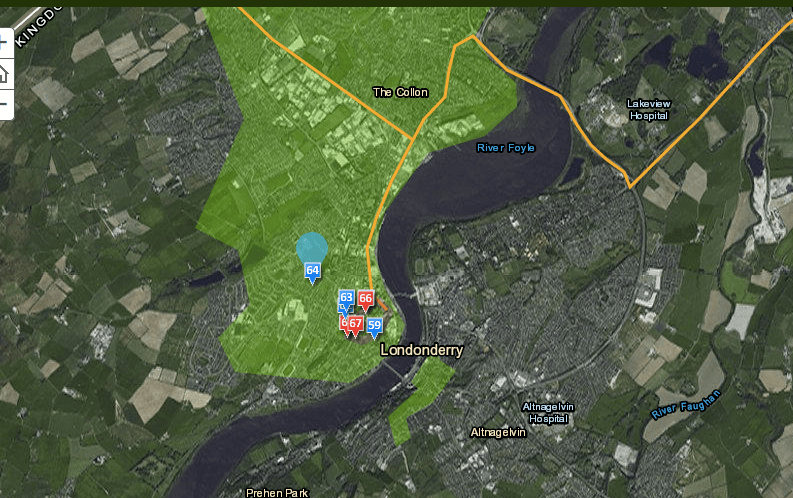 Green areas show the Catholic population in Londonderry/Derry – approximately. Things were going well with the basemap around Derry, but Belfast was still just a cluster of image flags – it was confusing. The map needed something to tie the flags all together. Belfast history of the Troubles is very complex. Mapping the Catholic and Protestant areas of Belfast would have been too tricky and I couldn’t find any maps of this in ArcGIS. The Peace Wall has many sections and we only really saw parts of it. 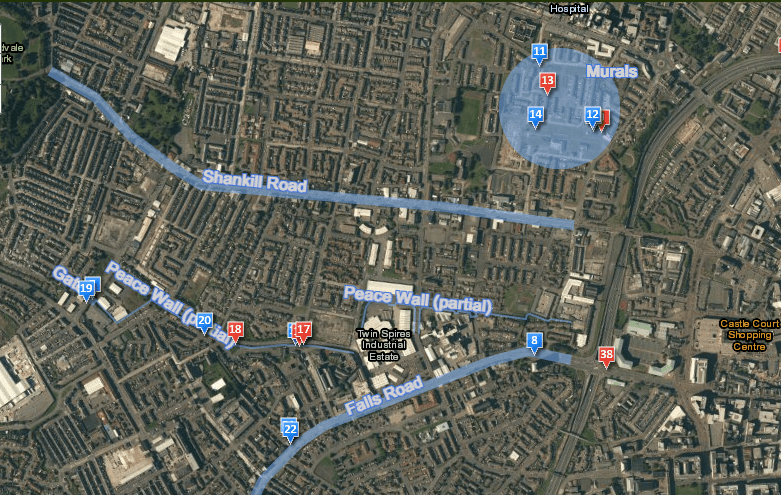 To add context to the story, I highlighted the major roads – the Falls Road and Shankill Road. I also highlighted the areas of the Peace Wall and gates that we saw. With these delineations, you could see where we were in the city and which side of the wall various things were on – how close the different areas were to each other and downtown. The blue graphics add context to the pins. The blue pins include text with the photo. I had to do a bit of research to make sure I had my facts straight. Luckily, iPhotos displays the name of the location in “Details”, so it was easy to find what I needed. It takes time to input all of this information. I had to make decisions on what to show and not show, and at what scale graphics should appear/disappear. I didn’t draw the tour routes in the city streets. In fact I rearranged some of the photos because they made more sense if they were not chronological. The tour routes only give you an idea of the ground covered. They are approximate. I did use my Frickbits data, but there are some stretches without any points, so I just chose a road that looked like the right direction. The dots are my location data. You can see the large area with no dots. This is typical of this level of tracking. Your exercise app is provides more detailed location information. I used a satellite basemap because you can zoom in and out to see the monuments, coastline and buildings, as well as what the land or city is like. For this story in Ireland, to see the land and coast is important, since we spent so much time driving through the country side. I did shoot a few “on the road” images and the basemap fills in the story. Basic basemaps. I chose “Imagery with Labels” because I want the viewer to get a sense of the Irish countryside and the density of the cities. It’s important that the viewer engages with the map, zooming in and out. I’m not sure how many people will do this, although I did include that prompt in some of the images. There is a bug, once you zoom, the map stays at that scale. I could see someone going through the entire story with the map zoomed all the way out. They’ll miss how the graphics, including the image flags, tell the story. All in all, I’m happy with the outcome. I had to modify my design strategy a bit to fit within GIS parameters. I think some things could be better. First, I think my iPhone has sunk my photographic skills. I need to compose better photos. Some of the photos are blurry because they are shot from the bus – but you’ll get the idea. I hope people figure out to enlarge the photos. Next, I would like to customize the photos pins. I would also like to have them appear/disappear at set scales, but this didn’t seem to be possible. I believe all of this customization is possible with coding. I think I spent more time working on this Story Map than we did on tour! But it will be faster next time and I have some more ideas of how to push the boundaries.